Join us ‘chez nous’ at our Beaconsfield brasserie and treat yourself and your family to our fabulous new Sunday roast sharing platters. For only 16.00 per person you can enjoy delicious free range Cornish sirloin of beef, slow-cooked stuffed Provencal lamb shoulder, or outdoor-reared Lincolnshire pork belly, with crackling of course, all roasted to mouthwatering perfection and served with all the trimmings; roast potatoes, Yorkshire puds, fresh seasonal veggies and lashings of homemade gravy. You can also tag a partner to share our whole roasted free range Bretagne chicken or our whole roasted fish of the day, both dishes for two. 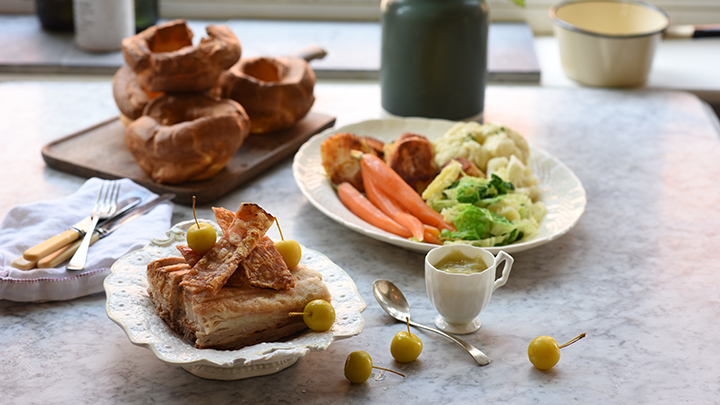 In fact, any dish that two or more people order is presented on a sharing platter, just like Maman Blanc would serve at home, making it the perfect family Sunday roast dinner. There really is no better way to celebrate Sundays than sharing fantastic food with your family & friends. You can view our Sunday menu here. To book a table please contact us directly. Claudia & the Beaconsfield team.